A massive crowd made up of traders, students, artisans and people from various walks of life on Tuesday greeted the road show organised by the Peoples Democratic Party (PDP) in all the parts of the state to create awareness among the people of the state concerning the February 16 Presidential and National Assembly elections. The road show saw the leadership of PDP in the state and the Campaign Director, Dr. Harry Oranezi, crisscross through the major streets of Awka, Agulu, Nise, Adazi, Nnobi, among others, with the mammoth crowd. The road show was led by the Vice Presidential Candidate of the PDP, Mr. Peter Obi. During the road show, Obi, the immediate past Governor of the state, intermittently spoke to the surging crowd, inviting them to vote for PDP in the forthcoming elections in order to empower the party’s Presidential Candidate, Alhaji Atiku Abubakar, to make Nigeria to start working again. Obi pointed at Atiku’s experience, past records, expertise in wealth creation and empowerment as among the many reasons why Nigeria needs him now. 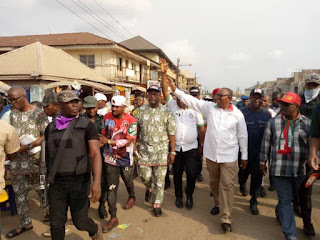 He assured the people of the state that “a vote for Atiku is a vote for the country to witness the type of unprecedented development Anambra State witnessed” under him (Obi). In the course of the road show, Obi addressed a mini rally at the Madonna Field Agulu, where he urged the people of the state to come out and vote for Atiku in order to banish poverty, unemployment, nepotism from Nigeria.